Life, all by itself, is busy enough, but throwing in the holiday season tends to kick the mix up a notch. As I squeeze extra lines onto my already full list of shopping, card writing, wrapping, and baking, sometimes I need a moment to check that list twice. Regular meals fall by the wayside as the extra miles add up on the car, and that all too precious "good night's sleep" has become a rare treat. This is about the point where Panera came to my rescue. Actually, not only came to my rescue, but gave me a nice midday break in addition to a special lunch with Mom and Dad. About a month ago, Daily BuzzFood sent out an questionnaire asking if Tastmakers were interested in writing a review on Panera soup. I think I took every bit of 2 seconds for me to sit up straight in my seat and stretch my hand high to the ceiling all the while squealing, "Pick me!! Pick me!!!" And they did. Setting aside an afternoon, Mom, Dad and I met up at our local Panera and spent a leisurely hour filling each other in on our busy schedules. With a gift card from Daily Buzzfood in addition to one free lunch from Panera's MyPanera Program, we ordered to our hearts content and soon had more food than we needed. Sandwiches, salads, breads, and 3 different soups graced our table, and a good amount of time was spent tasting, critiquing (we didn't have many), and complimenting our choices. 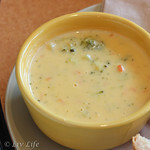 With soups made from real ingredients, Panera has always been high on my list of "good for you food choices". Amazingly, all three of us had different favorites, mine being the Black Bean. 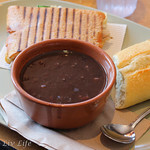 Always a fan of beans, Panera simmers theirs to perfection, not bringing you mushy bean chunks, but whole beans with an ideal bite. Big, bold flavor brings a heartiness to the soup, and a touch of spice warms the body on a cold day. Mom chose the Chicken Noodle, and all three of us agreed that the noodles Panera uses are exceptional. Thicker than your average pasta, the broad egg noodles gives one enough substance to be a perfect option in the restaurant's You Pick 2 lunch Choice. Dad, who is usually very calorie conscious, took a different route this day and ordered the Broccoli Cheddar. Silky, creamy and nicely cheesy, the soup boasts enough broccoli along with a touch of carrot to make you feel like you still had your veggies and your soup too. 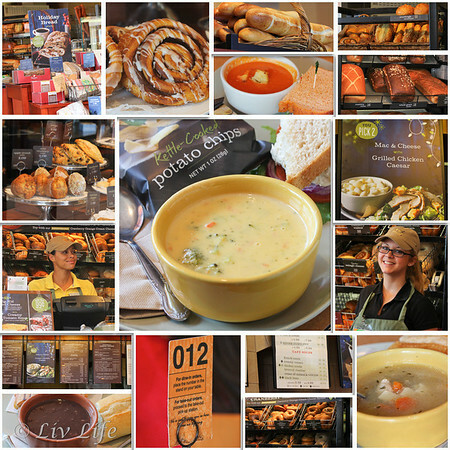 As part of our tasting process, Daily BuzzFood has asked participating Tastemakers to put together a soup of their own inspired by their day at Panera. 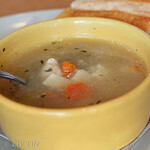 Taking a poll over the past few days, I've had requests to replicate nearly every soup on Panera's menu. The funniest version though, came from my vegetarian neighbor who proclaimed her deep love for Panera's French Onion Soup. Another vegetarian friend and I raised our eyebrows at her proclamation as we explained that French Onion is made with Beef Broth. The first friend's eyes opened wide, she thought for a minute and stated, "I think I'll pretend I never heard that..." and refused to broach the subject again. My husband's choice won for our inspiration with a special request for a simple Tomato version of Panera's Creamy Tomato. 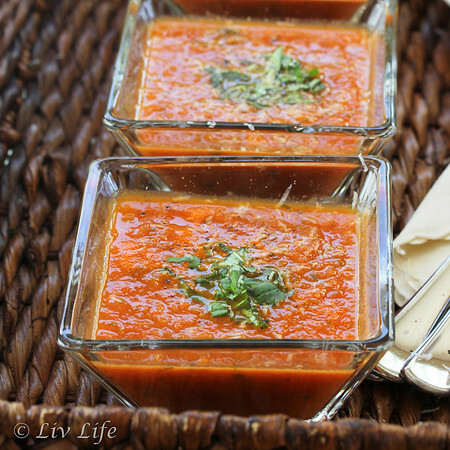 A huge fan of tomato soups, he is not particularly fond of the cream found in many recipes. Taking the lead from Panera as well as my time in Italy, I turned to just a few simple, fresh ingredients. Ina Garten recommends roasting tomatoes, and as luck would have it, my local farmer's market still had a few perfectly ripe Romas on the tables. Adding fresh basil leaves, good quality olive oil, onion and garlic had aromas of Rome wafting through my kitchen in mere minutes, and the addition of chicken broth turned the whole concoction into soup. Setting a steaming bowl in front of my tired husband as he returned from a trip across the country, he wearily spooned a taste, and before long was requesting seconds. Announcing that I had "done it" (created a Tomato Soup that tasted like tomatoes) he set off to bed with that comforting feeling that only soup can give. Many thanks to Panera for giving us a break in our busy holiday schedule, and for being the perfect healthy lunch choice for an afternoon with Mom and Dad. 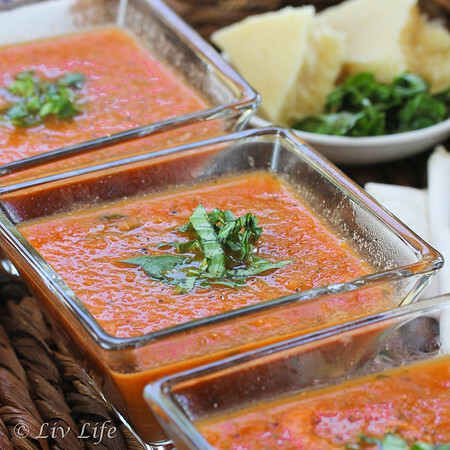 Filled with just a few fresh ingredients, this Roasted Tomato Soup brings healthy doses of antioxidant rich lycopene, which has been proven to be even more powerful with cooked versus raw tomatoes. Slice Romas in half lengthwise and rub with olive oil. Place on a baking sheet and roast until soft, about 1/2 hour. As the tomatoes are roasting, chop the onion and sautee over medium low heat with olive oil in a large stock pot for about 5 minutes. Add the diced garlic, a pinch of red pepper and thyme, continue to sautee until the onions are soft. Add the canned tomatoes and 1 cup chicken broth and about 1 1/2 cups water (use all chicken broth if desired). Chop the basil and add to the pot. About this time the roasting tomatoes should be done. Remove from the oven, and the skins should be slip right off. Remove the skins and discard. Add the roasted tomatoes to the stockpot. Bring soup to a boil and then reduce heat to a simmer. Simmer soup for about 45 minutes, adding water if the soup becomes too thick. When ready, use either an immersion blender (for coarser soup) or a blender (for more pureed soup) and blend to desired consistency. Add water to thin if necessary. Salt to taste. Ladle soup into bowls and garnish with sliced fresh basil, a sprinkle of freshly grated Parmesan and freshly ground pepper. Liv Life Note: We tend to go lighter on salt than many. As such, my one cup of chicken broth may be a bit light for some, use all chicken broth in place of the water if desired. Very yummy Kim, a perfect time of the year indeed for a ample delicious soup! Love your presentation too in the pretty square glass bowls! I second your husband's BRAVO! Jealous! I filled out the survey for that one but didn't get picked! :( Your version looks delicious! Love tomato soup! I didn't realize that anyone still did stuff with foodbuzz. I haven't thought about that site since they changed over and my inbox disappeared. I do love Panera's though and have always been pleased with their quality and a bit surprised too since they're a chain. When I first saw your soup, I thought it was a type of gazpacho and got all excited. I love tomato soup cold, but not so much hot. That being said, if it reminded you of Italy, I'm game to give it a try! I am not a fan of cream either in soups and love your version of tomato soup. My husband in particular loves tomato soups. I am going to bookmark this recipe. 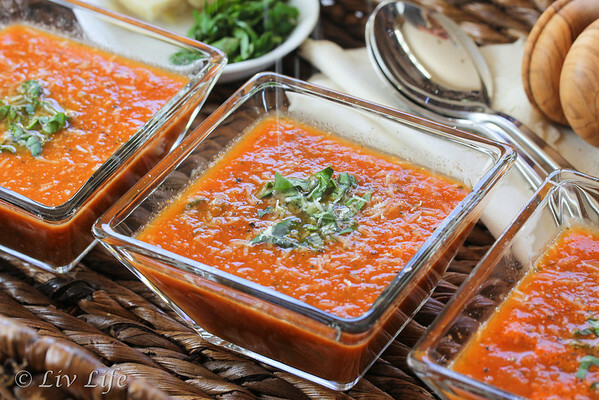 I made this soup for supper today... it is excellent!! Everyone loved it and could have eaten 2 huge bowls full! Next time, I am doubling the recipe! thanks!